Most of the decanter centrifuge operators on site are reluctantly to change for using some other brand centrifuge once they’ve been used to the existing units. It is easy to understand that it will take time to learn how to operate a different brand centrifuge, as different brands may have different operation regulations. Sometimes the operators are not able to make the decision whether to change the decanter centrifuge or not. The best way is to leave it away, no matter which supplier the centrifuge coming from, just get to know how to operate it. Just like the response from some of GN’s clients, “Our operators on site said GN’s decanter centrifuge is difficult to operate than other brands.” This is really frustrating for GN to hear about that. Every time when we got response like that from clients, we will do emphasize and firmly suggest clients to read GN manual, then they will know how to operate easily. This really is a tough and happy job. Note! Note! Note! 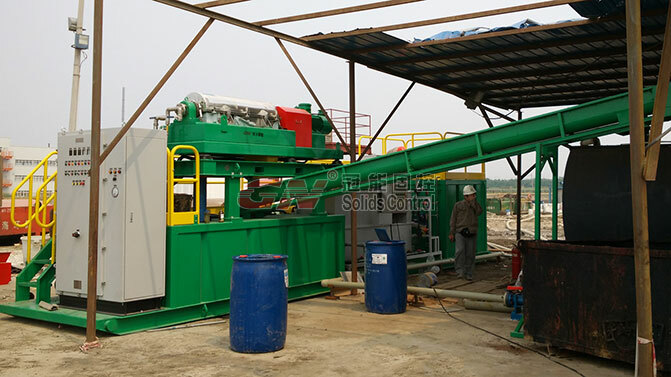 GN solids control would like suggest all the operators read the manual carefully before turning on the machine. Of course, some of the experienced operators would know how to operate all kinds of the centrifuge, but why not make it correct 100 percent. Sometimes, experientialism will lead big problem. Please read the manual, then you will know start the back motor firstly, then main motor, and then shear pump. When turning off, do it as feeding pump, main motor, finally back motor. Different RPM will bring different performance. At different drilling steps, the RPM of the centrifuge is different. Operators’ main job on operating the centrifuge is to adjust the RPM as the working condition and mud condition. For GN’s centrifuge, the operator can adjust both the RPM of the bowl and scroll to get much dryer or wetter solid discharges. Every operator need keep in mind to flush the bowl inside before stopping the centrifuge to prevent the mud blocking. Ignorance of this operation will lead to badly blocking of inside bowl by the dry mud cake which you can only take out by disassembling the bowl. Nothing is difficult so long you are willing to accept the new things. Now GN is going to use the centrifuge in some other industries like environmental protection and food industry. If you have any request, welcome to contact with us.